A “Tail” of Two Kitties—Ginger and Una | For Animals Inc.
We found them in a garage during the summer as we worked on trapping a feral colony in South Jamaica. When the neighbors saw us trapping, they approached us and told us there was a dead cat in their garage and some kittens. We went to investigate and found three tiny kittens with their eyes sealed shut from infection. We took the babies and set a trap for the mom, whom we now realized was not dead but was most likely in very bad health. We also left a trap set overnight…just in case there were other kittens. Turns out, this was a good idea. Ginger, Una, and Peachy when we first found them. Two days later, the homeowner called to let us know that that there was a kitten in the garage crying. Seems a fourth kitten had evaded us—but not for long! We quickly headed over to pick up the new addition, and so we finally had the mom and all four kittens. Unfortunately, the smallest of the four passed away after a few days. 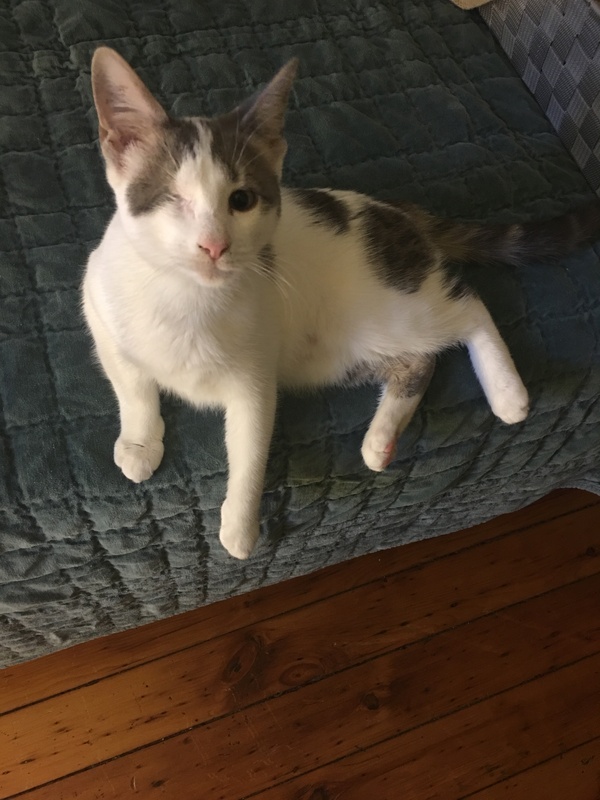 Born without eyes, she drank little and seemed so weak—we suspected she wouldn’t make it. But three kittens did make it. 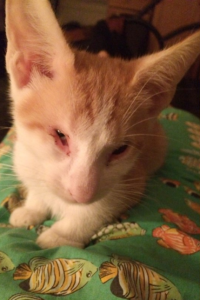 After a couple of months of good nourishment, love, and vet care, they got stronger, and the little male—we named him Peachy—was adopted within days! 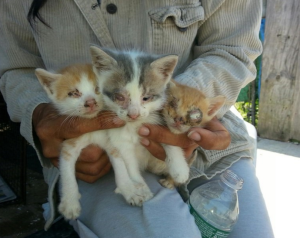 Two, however, still had severe eye infections. We named them Una and Ginger. We had to have Una’s eye removed, and Ginger still has issues with both of her eyes, but they are both gentle, beautiful souls. So, for starters, her name is now Uno Elsa Black Knight Wonder Woman. How has she changed our lives? Una in her forever home, where she is healthy and loved and very spoiled! She greets us at the door. She purrs like a machine. Everything is a toy, from an errant bottle cap to dental floss. The kids rush home to see her. She’s a cuddler and a lover. She’s spunky and outgoing and the kindest, sweetest kitty I’ve ever met — and I am not a cat person. We adore her. She has a super-fancy litter box, a cat tower and various scratching posts. Because she loves being at the window, I set a basket up for her with a cashmere blanket and she sits inside and looks out. This cat is a marvel! We still have Ginger. Ginger’s eyes are less than perfect, but she is what pure love is made of. She cuddles upon request, and like her sister Una, she plays with anything she finds. She is the love in my heart for sure. She pulled down our table cloth off the dining table with a few dishes yesterday and was not even yelled at. She is just pure love and all about fun and play. Ginger still awaits a permanent loving home. She needs to make sure I am safe in the shower, peeking in till I emerge. I cannot sit at my desk while she is awake; she comes to help. This is the perfect little girl. I love her so. If you are interested in meeting and possibly adopting Ginger, please send us an email through our contact page. And be sure to visit our adoption listings or Facebook page to see some of our many other cats and kittens in need of a forever home.